Dimensions: 7 x 36 x 36 in. dia. Notes: I am remembering New Paradigm, which I completed during my ITE residency in YEAR, as it was such a process piece. 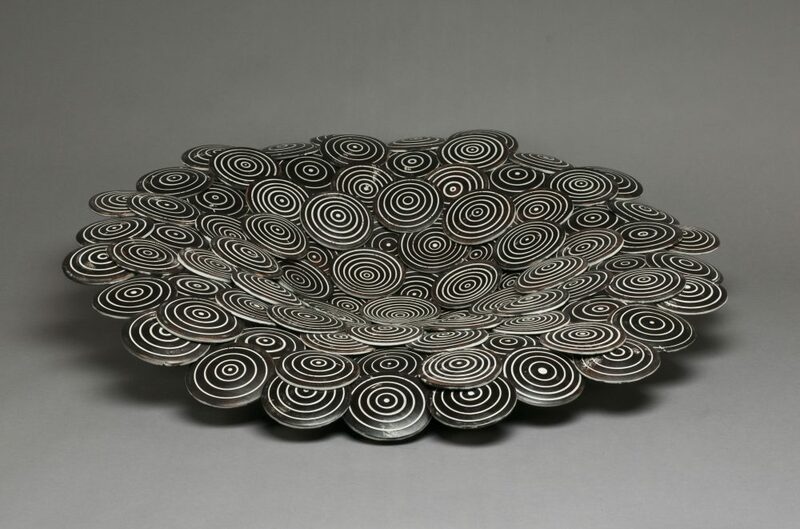 In this piece there were so many variations on how to work the black and white discs, to turn them concave or convex, all the same size black to white lines or variegated. The most interesting piece of the process was how to attach them together so that they would come into the form my mind had imagined. All at once, I realized how when I was watching one of my fellow ITE residents stitching his work together. This was wonderful as it would not only be the attachment I was looking for, but it would also allow the piece to move!! !